A drug used to tranquilize elephants is now on the streets in Manchester, New Hampshire. 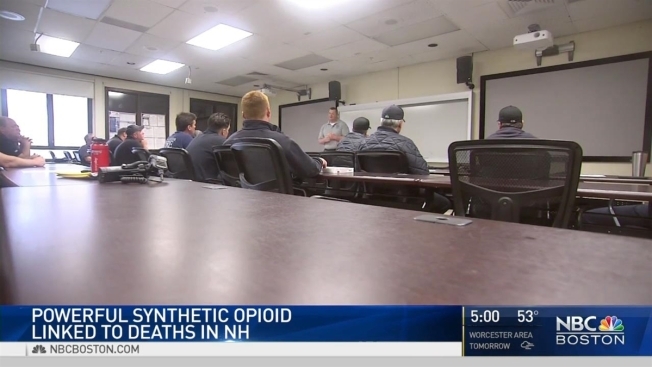 Firefighters say they can typically use one dose of Narcan to revive someone who has overdosed on heroin, but in recent weeks, they've been going through an entire pack on one call — four to five doses, and still sometimes that isn't enough. It's proof that overdose calls in the city of Manchester are changing. Carfentanil is knocking users out before they even finish their supply. "I overdosed, turned blue, started foaming at the mouth," said Manchester resident Mike Chase. "It definitely wasn't just heroin." Chase didn't know it at the time, but he had snorted carfentanil, an elephant tranquilizer that's made its way to Manchester. He was revived with Narcan, but not everyone's been so lucky. Carfentanil is responsible for three deaths last month alone. "Those fatalities that we went to, they had preloaded syringes or baggies they hadn't used yet, which means the stuff they were using was hitting them quick and hitting them hard," explained Chris Hickey, the city's emergency services director. Before their Wednesday shift, Hickey warned firefighters about the potency. "A couple granules on your skin can cause you to start to exhibit overdose," he told them. It's 100 times more powerful than fentanyl. So now, first responders are covering any exposed skin and wearing surgical masks with a special eye shield. "It's an added layer of protection for all of us," Hickey explained. For Chase, that nearly deadly dose of this new drug scared him sober. "I feel completely blessed," he said. But he's afraid most people will never get that second chance. "It's very hard to do, but you need to take that first step and ask for help," Chase said. Firefighters have responded to 30 overdoses and three fatalities in just the last seven days. The state lab will determine whether or not carfentanil is to blame.